This small home wine cellar takes up little space yet it can accoommodate 16 bottles of wine allowing you to have a wide selection of wines on hand chilled to serving temperature at any time. The manufacturer, EdgeStar, is known for its compact and portable household appliances that suit today’s accelerated lifestyles. The company has extended its product line with thermoelectric wine refigerators (as well as with a couple of compressor-run models) ranging from small to medium storage capacity. 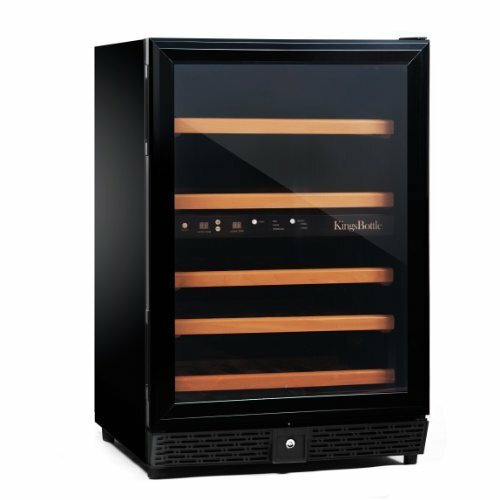 A perfect fit for countertop placement, the Koldfront TWR160S model is great for beginner wine collectors with not much space in their home. 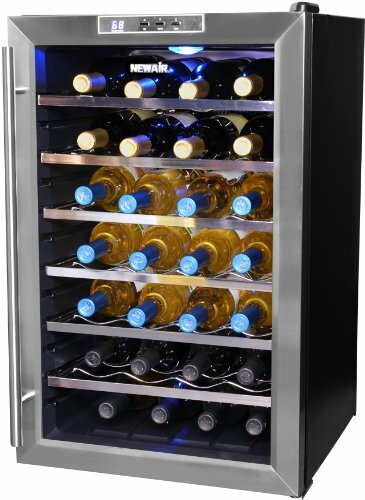 The unit can hold and cool up to 16 bottles of wine calculated for standard 750 ml bottles. The black cabinet has silver framed double-pane glass door with a tower bar handle. The door is right-hinged so it swings to the right side when yu open it. The door glass is slightly tinted to block out UV rays to protect the quality of your wines but it still provides a fine view of your stored collection. There’s a low voltage white LED interior light to enhance the display. The magnetic gasket of the door ensures airtight seal providing proper thermal insulation. 3 chromed pull-out metal shelves hold the wine bottles safely and you can place bottles on the floor of the cabinet. To make room for wider bottles you can remove one of the racks. This is a thermoelectric cooler which operates without a compressor. Thermoelectric cooling technology is based on the so-called Peltier effect and though the principles of thermoelectric cooling have been known since the 19th century manufacturers have started to use it in small home appliances only recently. silent operation – due to the lack of compressor the only noise-making part of the unit is the fan for circulating the air inside the cabinet. According to EdgeStar the noise level of the TWR160S wine cooler is only 30 dB, a low hum generated by the fan when it runs. no vibration – in traditional fridges the compressor can cause quite a lot of vibration that might disturb the sedimentation of solid particles in wines that occurs naturally within ideal circumstances. This problem however occurs if wine is exposed to constant vibration for a longer period of time. no hazardous cooling agents – since thermoelectric coolers don’t have compressor they don’t need coolants (CFC-s, HCFC-s chlorofluorocarbons) either, so they pose less threat to the natural environment at the end of the appliances’ life cycle. energy efficient operation – low electricity consumption. You can adjust the wine fridge to cool to temperatures anywhere between 52 – 64°F (11 – 17.8°C) which white wine lovers might find a bit too warm for their favorite sparkling and white wines. But once you figure out which setting is the best (it’s best to use a thermometer) for your taste temperature setting becomes easy. Price range: US$ 100 – 140 (US$ 6.25 – 8.75 per bottle). Warranty: 90 days on parts and labor. Next to the temperature control knob you find the light switch for the interior LED lighting. This is a low intensity light that doesn’t generate heat and uses little electricity. One weakness of this cooler is that when it is fully stocked you have to remove some of the bottles to access the light switch. Price of the Koldfront 16-bottle wine bottle cooler: this model sells for around US$ 100 – 140 (US$ 6.25 – 8.75 per bottle) making it a low cost wine cooler perfect for home use either on the counter or table top. Warranty: the manufacturer gives 90 days warranty on parts and labor. Haier 18-bottle wine refigerator review. 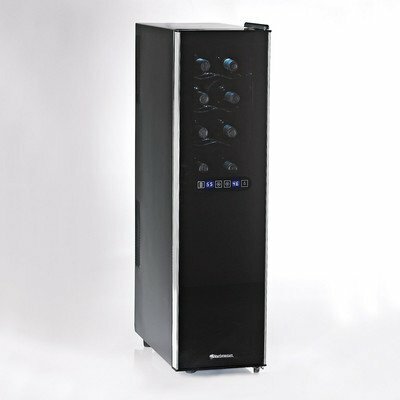 Avanti Dual Zone 18 Bottle Wine Fridge. This unit is for freestanding use only meaning that you mustn’t build it in in existing cabinetry. You also must leave enough clearance around the sides (2 inches according to the manual) and at the rear (4 inches) of the cooler for proper ventilation. See built-in wine coolers & wine refrigerators if you plan to slot the unit in the existing kitchen furnishing. If you block the air ventilation the fan mounted at the back of the unit will not be able to get rid off the hot air generated inside and it will run almost constantly causing noise and increasing electricity consumption and chance of failure. Find a cool spot with level surface in your home to place the wine cooler. If necessary screw in or out the leveling legs to help level the cooler. Do not place the cooler next to appliances that generate a lot of heat (cooker, oven). 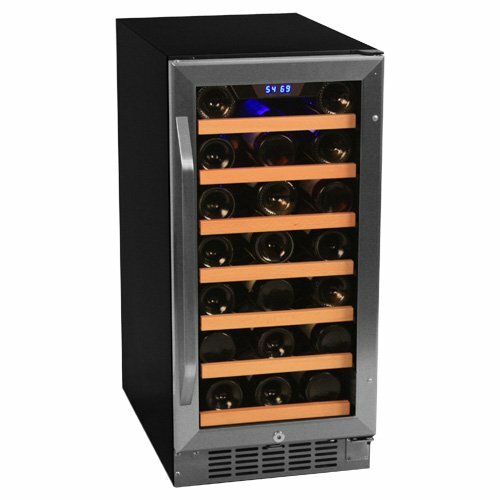 The wine cooler requires 115 V/60 Hz power connection. After filling up the wine cooler allow the wine bottles up to a day to reach the adjusted temperature. The wine cellar has received average-good ratings from users. Most reviewers have highlighted the quite operation, and compact design. The low price of the wine cooler is also often mentioned. Complaints: some users say that the unit cannot reach the lower temperatures of its range. A digital temp. gauge would be better instead of the manual thermostat. Longer bottles might difficult to fit in because of the interior light switch. It’s hard to reach the light switch and the temp. control knob in the back of the interior when the cooler is full. 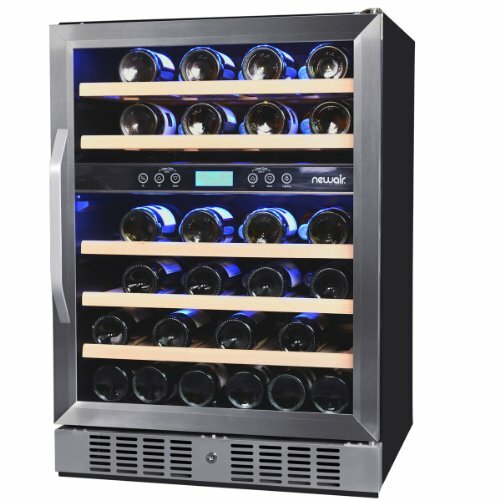 All in all the EdgeStar/Koldfront 16-bottle wine cooler is a nice low budget wine storage cabinet recommended both for aspiring wine enthusiast and casual wine drinkers.